TICKETS: Pay-What-You’re-Able ($5-$35) at www.chamberlab.org “On March 4th, ChamberLab returns with a concert featuring new music inspired by traditional Mexican folk tales.In a departure from our usual classical behavior, the ensemble for the evening will be the renowned Mariachi Luz de Luna. 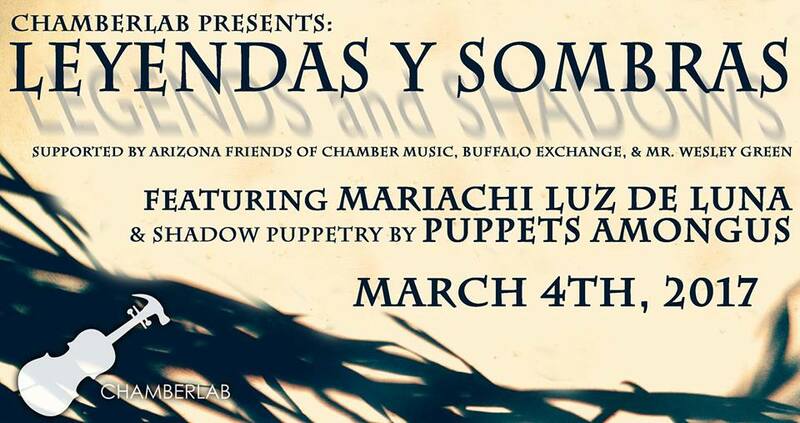 As composers, we’re tremendously excited by the possibilities and unique sound of these traditional instruments, and thrilled to work with such a prestigious group (frequent Calexico collaborators) here in Tucson, a city full of Mariachi history and activity.The composers for the evening will be ChamberLab mainstay Marco Rosano (of Orkesta Mendoza), joined by ChamberLab newcomer John Contreras, member of Mariachi Luz de Luna, and mariachi director at Pueblo High School, home of Mariachi Aztlán. Working with puppeteer Matt Cotten, each composer has selected a traditional Mexican folk tale for inspiration.LIVE SHADOW PUPPETRY BY MATT COTTEN Visual artist Matt Cotten of Puppets Amongus, will present the tales with live shadow puppetry in the Grand Parlor of the historic Scottish Rite Temple as the music plays. Matt has created beautiful storyboards and character designs for each tale, and the composers have scored each one like a silent film.”TICKETS AVAILABLE at www.ChamberLab.org.